Chevrolet Corvette. Almost everyone of us knows, what a masterpiece is expressed by these two words. It is a legendary sportscar representative from the other side of the Atlantic Ocean. It was conceived as a "Dream Car" from the very begining. It's origins are dated in the year 1953, when it has been showed to public for the first time on the motoristic show Motorama in the hotel Waldorf Astoria, New York. 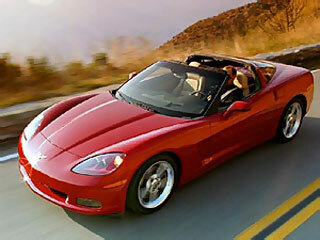 Corvette was a response to the fastly growing popularity of sportscars imported from Europe. The Chevrolet team of engineers under the lead of engineer and designer Harley Earl, have created a two-seat roadster with an agressive design, however very weak technology. Russian emigrant Zora Arkus - Dunt immediately fell in love with Corvette and was willing to cooperate with Chevrolet in the production. Thanks to this man, Corvette started to be a real sporty vehicle. The first model of Corvette has been internaly called as C1. Until today, there have been unveiled six models. It means that nowadays it's produced a model C6. Model C6 was introduced in january 2005 on the Detroit Auto Show. The most visible change is that the front lamps are not anymore damping ones. This is a radical change after 40 years of production of Corvette. With this step, the producer tries to address this car to the younger generation of a potentional owners, for whom this system looks obsolete. A car is distinguished by an expressivly aerodynamic profile with a drop shaped rooftop, which evokes probably the most popular model Sting Ray from the sixties. The basic version offers an engine with a title "Small Block". It is a V8 with a cubature of 6.0 litres, obsolete but reliable OHV and a power of 294kW (400 PS) provided near 6500 rpm. The engines are combined with a four-speed automatic, or a 6-speed manual transmission.The equipment consists of many luxury addons starting with an air conditioner and ending with a navigation system, which is able to find a vehicle in case of theft besides classic navigation. This basic model is a basement for the top german modifier Geiger Cars. 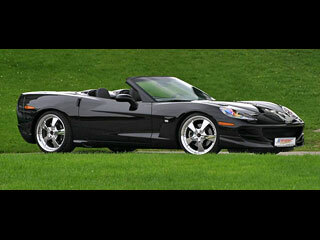 Thanks to Corvette's excellence and aerodynamic clarity, it hasn't been needed to modify the exterior of the vechicle. The modifier focused on technologies, engine and chasis. The skeleton of the engine power boosting is the Easton compressor with a water-cooled intercooler of the compressed air. Adequate air supply is fulfilled by two sport filters. Engine power increases forced engineers to exchange the original manifold - completely whole from the engine part to the ending silencers. The original have been exchanged with special, for this model tuned, inox pipes with an increase in diameter. Everybody knows these modifications forces change in the control unit to optimize power potential. Corvette has obtained new software considering all modifications. Thanks to these mods, engine has a power of 386 kW (524 PS), torque have increased to a gigantic value of 637 Nm-1. Acceleration from zero to 100 kph is 3.7s and a maximal speed is around 325 kps. These values puts Corvette clearly into cathegory of supersports and it can make european competitors scared. Engine modifications necessarily need chassis alternations. The original flat springs have been replaced by the more proper wounded springs. Together with sport shock-absorbers, they make a sporty but mainly safe set. On the front and also rear axles are new brackets to increase toughness. Brakes have also been alered. The original brake disks ha been exchanged with greater ones with inner air cooling. On the front axle, there are disks with a diameter of 355 mm and on the rear axle, the 345 mm ones. A part of the new brake system are 4-piston brake seddles with brake lining originally from circuit specials. Multipart wheel rims are really a pleasure to look at. They are completely chromed. They can show off themselves by dimensions of 9.5 x 20" in the front and 11 x 20" on the rear. Wheels are completed with tyres with dimensions of 255/30 R20 in the front and 305/25 R20 on the rear. There are also a few of exterior changes, but they are just minor. Mainly added so called gills on the hood for better engine cooling and erasing typical Chevrolet flags. Also both of the bumpers have been altered. Front is dominated by a vast intake opening, which is completed by two smaller on the sides of the bumper. The rear had to be changed because of a new exhaust. Truly, it's not prefectly estethic, but from the view of functionality, it performs it's task well. Chevrolet Corvette modified by Geiger Cars have the ambitions to compete with the european and japanese supersports. High power with a typical american luxury has all the assumptions. Also the cost is important. In this area, with the price starting at 90 thousand euros, it's a leader in its cathegory. 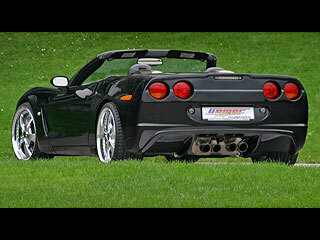 Do you like the Chevrolet Corvette C6 Cabrio modified by Geiger Cars?